I have been fascinated by fabrics and needlecraft since I was a small child. I remember being sat on the floor in my Grandfathers house laying coloured tissues over my dolls in an attempt to fashion them some rainbow outfits. I was probably 3 or 4 years old. I can remember my Mum telling me off for wasting tissues, but my lovely Grandad saying to let me be, I was obviously happy. A few years later, my most treasured possession was a paper bag filled with tiny fabric scraps, a reel of thread and a needle. I was convinced I could stitch all these tiny scraps together into something beautiful. My Mother wasn't a seamstress, she could knit and taught me when I was very young. I loved that she knitted all my dolls clothes, but wished I had someone to teach me how to sew. When I was probably 12, My Mum bought me a subscription for one of those monthly collect a series sewing courses. It was aimed at young teens, I think very probably a promotional leaflet came inside a copy of Blue Jeans, Patches or Jackie! I think it was called New Look, and each month a new sewing and knitting pattern would pop through my letterbox, ready to be filed away in the ring binder. I didn't own a sewing machine then, but I read, and re read every instruction booklet for every pattern, and even sewed myself a dress entirely by hand. A simple slash neck dress with batwing sleeves, only two pattern pieces, front and back. I used some green plaid cotton with a little gold thread woven through it. I remember sitting on my bed painstakingly sewing the seams with a tiny back stitch, and once it was finished, rushing around to see my friend (already a pretty accomplished seamstress.) wearing it proudly. I eventually learnt to sew at school. My school needlework teacher , Mrs Geddes was easily one of my favourite teachers. I loved lessons tucked away in her classroom. She was very thorough, and taught me the value of good preparation, and of practising a skill.After completing an O Level in needlework, I decided to continue to A level, Needlework and Dress. I believe it was an A level that was discontinued the year after I took it. I guess it was quite an old fashioned A Level, but the basics of good dressmaking, I don't believe ever go out of fashion. I do think it's a shame those basics are not well taught anymore. I honestly despair at the "Textiles" lessons my children have so far received at high school. Even during practical exams, she'd make us a welcome cup of tea. During my time in the sixth form, I was fairly experimental with my clothes, make up and especially my hair. I was briefly banned from attending school assemblies because my mohican (which I wore braided .) was considered a poor example for the younger pupils in the school.I was also banned from a school trip because of the length of my skirts. Mrs Geddes, a woman of a certain age who invariably dressed in tweed skirts and twinsets however, never batted an eyelid at my fashion or hair choices, and I loved her for that. These days when I sew, I have the wise words of Mrs Geddes in my head. Sometimes, when I cut corners, or skip something I really know I shouldn't I can feel her mild disapproval, which is why I called this blog Lazy Seamstress in the first place. I am grateful for the good grounding in dressmaking skills that Mrs Geddes passed on to me. I think good habits and skills are a gift, and sometimes allow me to cut the occasional corner, and I hope Mrs Geddes would agree if she were here to see. So, why am I blathering on about my old Needlework teacher and basic skills? Simple really, I'm thinking of running a mini series on here, of back to basics for all aspiring seamstress'. I haven't bothered before because I'm fairly sure this has already been covered in the world wide web, probably in a million ways already, but why not eh? I'm lucky to have been taught well. I'm not the worlds best seamstress, I still have plenty to learn, but I hope I can pass on a little of my skills and knowledge to someone out there. I will be combining the basics taught to me so well at school, with my own experience and personal opinion. 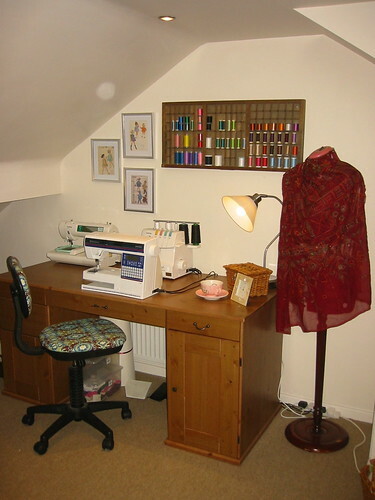 Back To Basics will start with the very basics, of choosing a sewing machine and organising your sewing space. Watch this space. My mum had a sewing machine, but absolutely no tolerance for my enthusiasm- she finally loaned it to me a couple of years ago and I learned to sew at an evening class. I've had a 2 yr break (travelling and baby) and I've just started going to another class with my teacher (and now have my very own ex-school sewing machine at least 20 yrs old!). I absolutely love it and so wish I could have learned something useful and interesting like this at school -when abroad 'hunter education' was more appealing for choices(we moved before I learned to shoot), in the UK high school it wasn't an option. So I'm looking forward to your Basics and organisation tips :) Thanks! Jeanette, this sounds wonderful! I was kicked out of sewing at school as out teacher had time for 3 girls in her class and that led to idle hands and we all know that they get into mischief. I know i have not popped by in ages been dealing with sickness and disability. i think your back to basics mini lessons sound great! I have enjoyed catching up with your posts Ernest is just adorable! I think it's great idea Jeanette. Oh this sounds wonderful. I cannot wait to learn! I have a basic sewing machine and really want to learn.